Shaquille Peachy, Debbie Hewitt, Peter Boschman and Jarrad Simpson. PARKES IGA has again tapped into the Christmas spirit by donating a cheque from their IGA Community Chest program giving $564.43 to Currajong Disability Services. 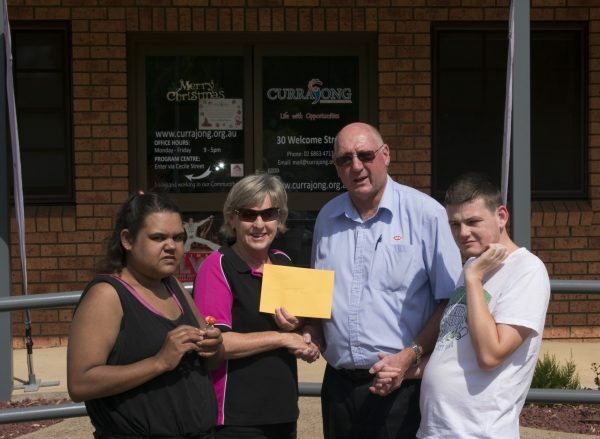 Proprietor/ Director Peter Boschman said Currajong were a worthy recipient and the local support was in line with the national agenda held by IGA towards people with disabilities. “Our funds are dispersed from certain promotional products through the network,” he said. “A proportion of those funds go to local nominated groups. “Currajong are a very important organisation within the local community and we are more than happy to support them,” Peter said. IGA nationally is a supporter of the Special Olympics and locally have been a big contributor to Currajong Disability Services for many years. For Currajong Disability Services Debbie Hewitt it is no surprise that IGA again has come to the party – exhibiting kindness above and beyond. “Such a donation is a tremendous bonus for Currajong,” Debbie said. “Given the increased costs and new framework we operate under it is even more important now than at any time before.